Hungry hamsters need a balanced diet full of grains, leafy greens, fruits and vegetables. But that balance is delicate, which means a commercially prepared hamster food is usually your best bet for a healthy hamster. Your pet will enjoy a few tiny tasty treats sprinkled in, but keep them in moderation so his weight doesn't get out of control. All hamsters have the same basic nutritional needs, but the Syrian hamster needs a bit more food than his dwarf hamster cousins. The Syrian hamster is the largest and most common type, according to the ASPCA. For example, if you're giving your hamster sunflower seeds, give no more than two per day to a dwarf hamster. Your Syrian hamster, on the other hand, can scarf down six seeds with no ill effects. Commercial hamster food, which usually comes as a mix of grains, seeds and pellets, offers the right balance of nutrition for your pet. Talk to your vet about how much to give you hamster each day, and keep in mind your hamster is likely to squirrel some away in his nesting area to save for a late-night snack. Avoid mixes that contain dried fruit, which has too much concentrated sugar to make it healthy for hamsters. 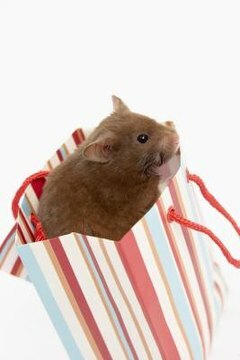 The ASPCA recommends you supplement your hamster's diet with healthy treats every two to three days. Give him a couple of leafy greens, such as spinach or lettuce, along with some fresh grains. Cut slices of fruits such as apple or pear, and throw in a nut or two. Go light with the nuts, which are high in fat and can cause your hamster to become overweight. One almond a day is plenty for your hamster. He will also enjoy a bite or two of vegetables such as celery or broccoli. Hamsters must gnaw continuously to keep their front teeth filed down -- the teeth continue to grow throughout his life. Instead of a food mix, give your hamster a lab block of food periodically. These blocks contain the same basic ingredients, but in a more solid form to help the hamsters wear down their teeth. You can also give him dog biscuits or twigs that haven't been treated with pesticide or fertilizer -- he won't eat the wood, but it will help file down his teeth. Your hamster needs plenty of water, so give him an ample supply at all times. A drip bottle is best; hamsters are likely to overturn a water dish, dump food in it or defecate in it, making it unsafe to drink. Hamsters aren't the best social animals, so if you have two hamsters in the same cage, give them each a separate water bottle. Hamsters are known to bully each other and keep the other from drinking the water he needs. Do Guinea Pigs Like to Chew on Wood Blocks? What Kind of Wood Is Safe for Hamsters to Chew? What Can Teddy Bear Hamsters Eat?